William Shakespeare — who’s remarkable for so many things that it’s easy to forget the thing he’s perhaps most remarkable for: the fact that he doesn’t reveal himself in any of his plays — was born in 1564, in Stratford, a tiny village which at that time had a population of approximately 1,500 people. 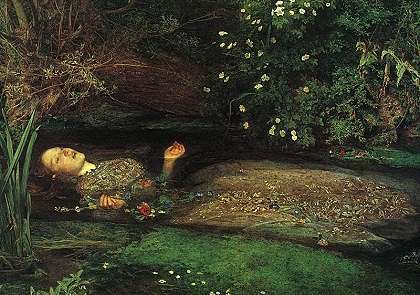 In the summer of 1579, when Shakespeare was fifteen-years-old, a young woman named Katherine Hamlet fell into the river Avon and drowned, an incident the young William Shakespeare would have for certain known about. It’s not much, but it’s something. Poor Ophelia, with her garland of rue. Even in Shakespeare’s time, men drove us to madness and left us with the consequences. Have you seen Gregory Crewdson’s “Ophelia”? Hi Averil Dean. No, I haven’t seen Gregory Crewdson’s “Ophelia,” and what’s more I haven’t even heard of it. Are you recommending it? “Garland of rue” — that’s very good. Yes. Gregory Crewdson is a photographer who shoots these very elaborate, beautifully lit compositions with a large-format camera. Very surreal. If neo-noir has an expression in the world of photography, Crewdson is it. I can’t find a specific site to link because my work computer won’t play, but if you google his name you’ll see loads of images. “Ophelia” is a favorite of mine.